Traditional abrasive blasting used sand to remove imperfections from a surface and to reshape materials. Over time, however, it became known that sand could have serious health consequences. Beyond that, it was not a material that could be used again, making it something that had to be replaced. In response to this need, glass beads were used in place of sand. Unlike sand, glass beads are not harmful to one’s health and can be used several times before needing to be replaced. You may have taken note of this advantage and have decided to use glass beads for your project. What you may be confused at, however, is the exact usage of a glass bead blaster and how it functions. 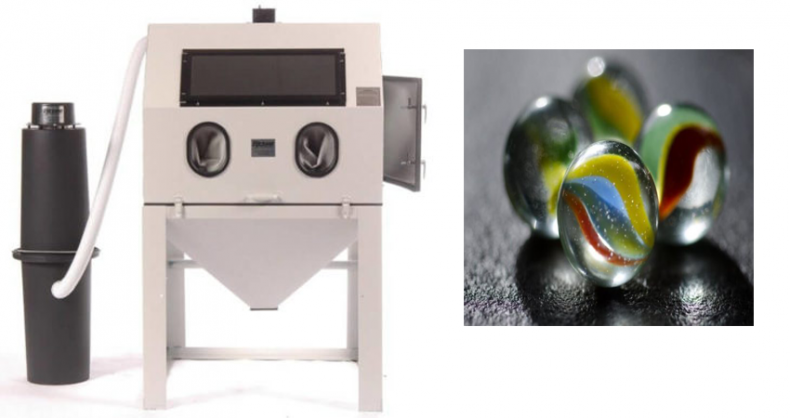 If you have decided on glass bead blasting for your project, here are some tips that will help you learn how to use your glass bead blaster. When you are using any type of abrasive media on a project, the first tip is to make sure you are safe during the entire process. Because you are handling hard objects that are being forced out of a blaster at a rapid speed, you run the risk of possibly being harmed by these heated objects, so you must take the steps necessary to prevent possible injuries. This includes wearing heavy clothing that will be able to withstand impacts from these objects, heavy gloves and work boots that protect your hands and feet, thick glasses that will keep your eyes from dealing with any harm, and a hat to keep your head protected. During the process of bead blasting, you will also be creating a lot of dangerous chips of metal and other materials that will be floating in the air and can be inhaled. You must wear a mask to ensure that none of these materials are inhaled during the process. Lastly, find a pair of large earmuffs that will protect your ears from the loud noises of the bead blaster. One valuable tip that will help you to get more out of your bead blaster is to prepare your surface before you begin working on it. For example, if you are attempting to blast a metal surface, you will need to pressure wash it beforehand, as contaminants such as grease, oil, and certain types of salt residues can eliminate the effectiveness of your blasting and may actually cause more harm than good to the surface. In addition to these types of contaminants, you must make sure that any stickers or objects that are not meant to be on the surface are also removed as these can waste your glass beads and prevent you from reaching every spot on the surface, as well. Using your glass bead blaster wrong not only ruins your project, but also puts you in harm’s way. That being said, what is the proper technique? Some tips that will help you include not concentrating your attention on one area for too long as it can strip too much of the material away, keeping the blaster tilted at a 45 degree angle in the direction you are moving so as to avoid focusing your blaster on one specific area, and using a side-to-side motion that will make sure you get each of the parts of your surface. Glass bead blasting is a great way to eliminate potential toxins and use a more eco-friendly material, but it can become a problem if you do not use the blaster properly. To prepare for your upcoming blasting project, use the tips above so that you can get through the project safely and effectively.